I think this might be the first drawing I’ve done this year. Maybe. I’m going to have to go over my different sketch books and see. This is from a café called Kupolen (The Dome) at one of the local malls. 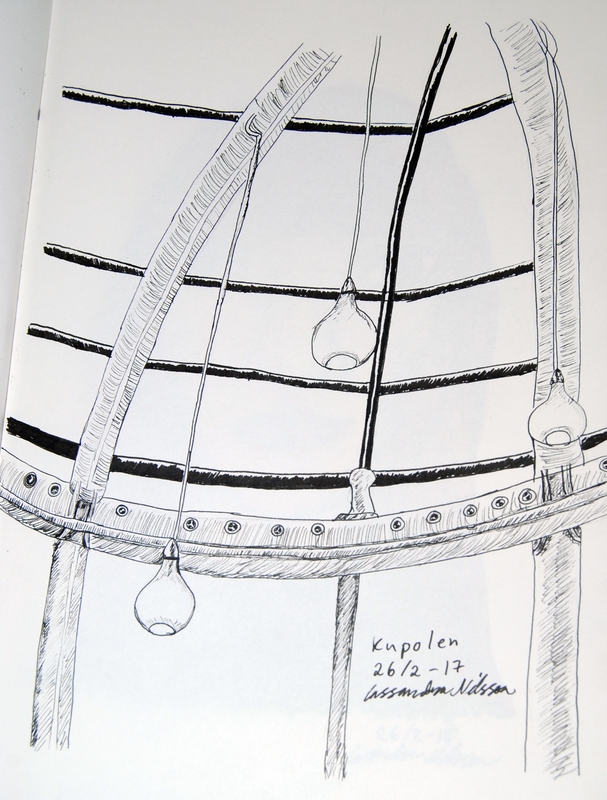 It’s – surprise, surprise – a dome and I sketched the inside of it with the lamps hanging down. You can tell that I’m horribly rusty. I realise it’s been a while, which has been due to a combination of life being unusually hectic and the fact that I haven’t been producing much art. A lot of my time has been spent building my own home, since I moved out from my parents’ this January. I didn’t have much in way of furniture, so there’s been quite a few trips to IKEA and curses trying to put the furniture together. But now I’ve settled in. My art stuff is unpacked and easily reachable, and I’ve done a few drawings. I’ve also started meeting up with the local chapter of Urban Sketchers again, even if my presence there is sporadic due to my work schedule. I’m going to start posting again. As I don’t have a scanner, the quality of pictures won’t be as good as previously, but hopefully we’ll make do until I’ve got myself one. On Sunday there’ll be a drawing up. Come back then!